Coming out of sabbatical with a gig tonight at Cambridge’s Bright Club Re:generation event during the Cambridge Science Festival. 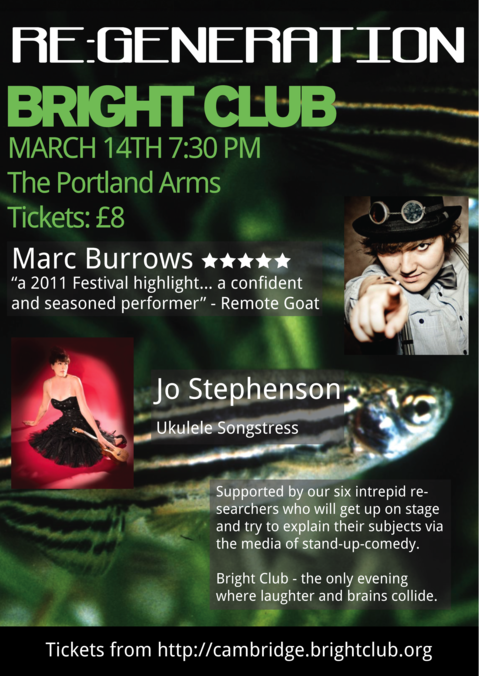 Bright Club is an event where scientists present their data – with a comedy angle! I’ll be unveiling two new Professor Karmadillo songs to the public – one on the Mars Curiosity Rover, and t’other on one of the freakiest looking creatures that also aids cancer research – the naked mole rat. I was approached quite a few months ago by Greg Crowther from Sing About Science to do an interview. After very patiently waiting for my response (between the baby and the house move last month things were a wee bit busy!) to the questions I managed to reply and sent my response on to him. Which he very promptly placed online here! To celebrate the fact a big announcement is being made by CERN today we are giving away the Professor Karmadillo track ‘ConCERNing Higgs’ away for free today! We’ve made the hunt for the track a bit easier than the search for a Higgs Boson – you just need to use the link below! Don’t forget, if you like this songs there’s a whole host of science songs on the Giant Leaps album! Get it off one of the stores below! A live performance is captured here! So the Science Showoff event is not happening as it was, but nerdy entertainment is still happening courtesy of Geek Cabaret! Plan to be there doing an acoustic set of songs! ‘Giant Leaps’ album cover unveiled! The album cover for the Giant Leaps release on February 29th 2012 has now been revealed! It’s been done by Matloob Qureshi, who shall appear on our contributors pages soon! For know all I can say is – admire the artwork! The Verb – a radio show is Radio 3’s cabaret of the word, featuring the best poetry, new writing and performances – and they very cordially invited me to talk and perform works as Professor Karmadillo. This was a great hour long recording session – you can listen to it on BBC IPlayer for another week. Ian McMillan was a wonderful host, who completely made me feel at home despite me missing all my cues – luckily all the long pauses should be edited out the show. He was also great at warming the crowd up – I want him to introduce me for all my shows! I can’t decide if the highlight of the show for me was Philip Langeskov’s short story or the excerpt of the poem about the train ride from Norwich to Sherringham by John Osbourn. Both were great, so I would recommend listening to the show to decide for yourselves! I have been invited to perform and discuss my work for The Verb in Norwich on Tuesday. Recording details here and the recording should be on BBC IPlayer come Friday.